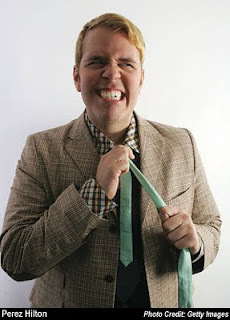 Perez Hilton to Replace Simon Cowell? In a press call last week, Simon Cowell revealed he thought that blogger Perez Hilton would make a good candidate to replace him next season. Denouncing Howard Stern and Madonna as potential judges, Cowell speculated that Hilton would be a nice fit because he's "funny, has good taste in music," and something I did not know, has his own music label. But me thinks two statements Cowell made are wrong, causing me to question his judgment: 1) He would like to find a Taylor Swift because she's "relevant." Well if relevant means tone def, then by all means, find you a T. Swift. 2) He "likes" Lady GaGa because she's "smart." Well if smart means wearing cones for shoulder pads and zippers for eye patches, then get you a GaGa! But another snippet I found to be interesting was that he predicts a lady for a season 9 win, indicating that most of the males seem to be on the same level this season, which might cause them to cancel each other out. I'm sure Perez is elated with this news, but are you? Who do you think would be a good Simon successor?